Check out my Dutch oven cookbooks! This one is the last installment in my series on breaded chicken strips and sauces. It's been a lot of fun thinking of new configurations for an old standby. I’m a big fan of hot sauce, and I’ve always wanted to be able to make it from scratch. I had done some studying a long time ago, and I read about having to store it and let it ferment for months and months. That wasn’t going to happen. Most of the other recipes for wing sauce I found were all based on Frank’s. Finally, I morphed a bunch of ones that I saw into this one. It was a great sauce. The amounts are estimates. Really, I just added these things and kept tasting to get it to the point where I liked it. The core ingredients were the butter, the tomato sauce, the heat, and the vinegar. The procedure for this dish was similar to the other two (the sesame cashew chicken Dutch oven recipe and the chocolate chicken Dutch oven recipe ), in some ways, and in one big way, different. I still fried dredged chicken breast pieces, then made a sauce. 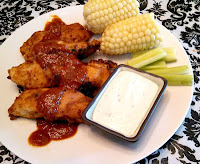 Finally I coated them with sauce and baked that on, serving it all up with just a little more sauce and side dishes. In this case, however, since I wanted to give the sauce plenty of time to simmer, I started with it. I lit up some coals, and once they got white, put 10-12 of them under my 8” Dutch oven. I put in the butter to melt. Then I diced and finely minced the onion and the garlic. By that time the Dutch oven was hot, and the butter melted. I tossed in the onion bits and garlic, with a little salt, and let them sweat. Once those were translucent, I added in the additional butter, let it melt, and then added the tomato sauce, the cayenne, and the vinegar. These four ingredients (well, and salt) are really the core of the whole dish. I let it simmer a while, then started tasting it. I added a little more of the cayenne or the vinegar to balance the overall flavor. Finally, I minced and added the green chilis, and the salt and pepper, and just let it simmer. I used a whisk to briskly stir it up and break up the chunks as much as possible. In between simmerings and tastings, I was also preparing the chicken. This was done just like the other dishes. 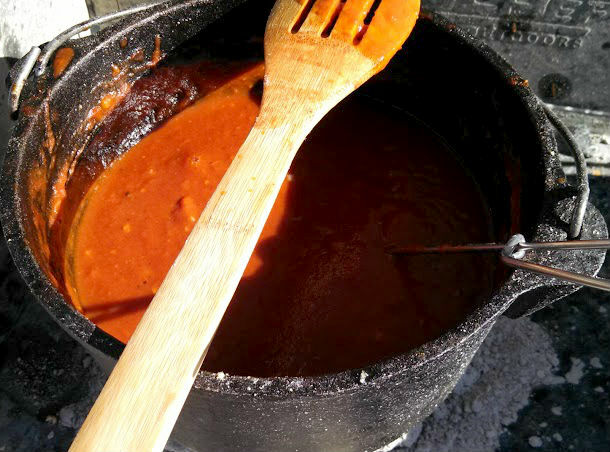 I first got about 20-24 lit coals under a 12” Dutch oven, with about 2 Tablespoons of olive oil in the bottom. I mixed up the flour and spices. I sliced the well-thawed chicken breasts (skinless, boneless) into 3-4 short strips each, and dredged each chicken piece well in the flour mix. Then, I began frying those pieces in the heated 12” Dutch oven. I had to do it in several batches, because I had more chicken pieces than I could fit into the bottom of the Dutch oven. I cooked each piece about 10 minutes a side. I had to pay close attention to the heat under both Dutch ovens, so that the chicken would brown nicely, and the sauce would keep up an easy simmer. When all of the chicken was done, I put it all in the 12” Dutch oven and drizzled about half the sauce on top. I stirred all that great chicken and sauce up, so I could see that each piece was well coated, but not soaked. I put about 10 coals under that Dutch oven, and put a 12” circular grill on top of it. Then I put on the lid with upwards of 30 coals on it. The grill makes a space under the lid, so that moisture can escape. The extra coals on top are needed to make up for the heat that escapes as well. This creates a dry-baking environment, and the sauce cooks on to the chicken in sort of a glaze. There are lots of things you can do to create the gap in the lid. The grill is just one convenient way for me. I didn’t need to bake it long, because everything is actually cooked at that point. I used that extra time to steam a few corn cobs in another 12” dutch oven as a side dish. When I served it up, I included some celery strips, and some blue cheese or ranch dressing as an additional sauce to balance out the heat of the sauce. I was very pleased with the results. It was delicious! Unfortunately, the acidic sauce also ate the patina off patches of the bottom of my 8” Dutch oven, so now I have to reseason it! Here are more great Dutch Oven Chicken recipes! Ya know its HOT when IT STAINS THE SPOON!!! Have to make me a batch, thanks Mark! We’ve recently launched the website RecipesUS.com. It’s a search engine that aims to gather all the best recipes from US websites and blogs in one place. RecipesUS.com is part of the world’s second largest family of recipe sites, with sites in 37 countries, and hundreds of thousands of visitors every week. We’ve noticed that you have a lot of great looking recipes on your blog that we would love to feature on our site. To read more about how it all works and to sign up with your blog, please visit: http://recipesus.com or send us an email on info@recipesus.com. We look forward to hearing from you!